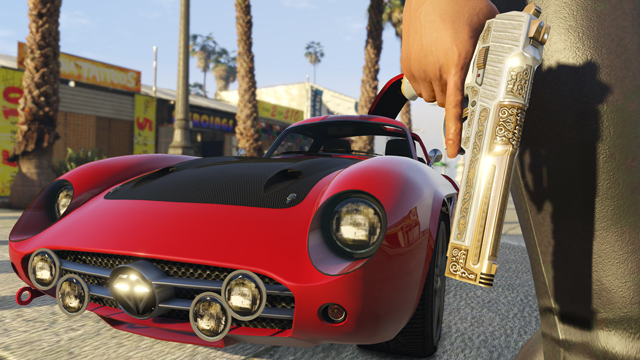 Rockstar has teased a new car (Looks like a Benefactor) for the game and what could be a new or upgraded pistol. The pistol itself looks like a modified .50 from GTA 5, It can be a new skin or a new gun. The sports car has gullwing doors, and at least two familiar modifications – the low rally lights and carbon hood. Rockstar also said that players shouldn’t expect any new Heists soon, although more DLC is on the way for GTA Online. Rockstar also confirmed that those using single-player mods in the PC version of the game are not being banned, but the mods themselves could be causing some issues with the game. YouTuber DomisLive (aka Dom) leaked fresh reveals on the impending GTA 5 Gambling and Lottery Ticket DLC which have been unearthed via leaked game files. The purported leak suggests that more mini-games related to rumored DLC are currently under development. Online reports earlier noted game codes linked to poker, pink slips and lottery system with several new additions made to the Casino building including new banners, large stickers, signboards, and some funny notice-boards. Fans can also catch a glimpse at the new ad-boards hinting some details about the gameplay elements involved in the Casino DLC or also called Gambling DLC for GTA 5 Online. Lady Luck banner can be noticed on the front right-hand corner of the Casino building facing the road. A couple of shark card ad-bills and one ATM sign bill on the glass windows that lead to the front door or the main entrance of the building can also be spotted.